ALDI topped the field for overall customer satisfaction, value for money, private label products (more than 90 per cent of ALDI’s products are exclusive brands) and its “Special Buys”. Special Buys won five stars within the deals/specials availability category. On sale every Wednesday and Saturday, Special Buys range from ski gear to furniture, homewares and appliances, and can be found each week in the store’s catalogue, which ALDI says is the most read publication in Australia. The stores scored five stars for layout and presentation, encouraging the ongoing rollout of store makeovers. “This is a humbling achievement for us and we are very pleased that we have been recognised by our shoppers and the industry,” said Adrian Christie, Communications and Customer Service Director. 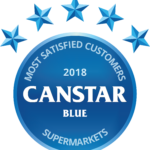 “We’re well known for the great value we provide our customers, but just as important to us is ensuring our customers have the best possible experience in our stores and that they thoroughly enjoy our high quality fresh fruit and vegetables, meat and every day grocery range. “As we enter our 17th year, we remain focused on delivering an alternative shopping experience that we define as Good Different.